An “Aron Kodesh” is a Holy Ark. The Holy Ark in the Gordon Chapel at Congregation Beth Israel is made of Acacia wood. 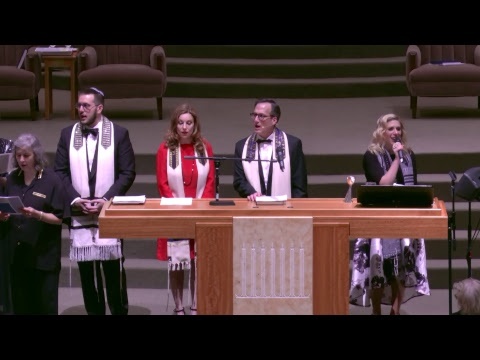 It was created when Rabbi Samuel E. Karff, Rabbi Emeritus, recognized the opportunity to beautify and enhance (hiddur mitzvah) the chapel’s sacred furniture, including pulpit desks for the rabbi and cantor. He identified acacia wood from its Biblical source, and set out to find a craftsman who could construct a Holy Ark to hold the Torahs. In the early 1980’s, the pieces were completed and set in their places on the bimah (stage) in the Gordon Chapel. In recent times, while standing before the Holy Ark, I noticed that pieces of wood were separating. In the winter, the wood separated leaving gaps that allowed the doors to swing closed after they were opened. In summer, the gaps closed up due to the increased humidity in the air. Eventually, more gaps opened and a permanent solution had to be found. Beth Israel leaders examined the problem with experts in wood craftsmanship. They conclude that the Holy Ark was a unique piece of construction; the solution would require unique craftsmanship, too. With no obvious craftsman available, Bruce Levy, Temple president, examined the Holy Ark for evidence of any identification of its original craftsman or origin. The only evidence he found was a signature of the artist: one initial and the last name, “R. Deatherage”. In this age of Google, he entered the name and clicked “search.” Lo and behold, the artist’s name popped up: Roger Deatherage. And, to Bruce’s astonishment the artist also lived in Houston. An immediate call to the artist opened another door to a relationship that had never really ended. The artist remarked that among his numerous projects, designing and building the Holy Ark for Congregation Beth Israel was one of his most favorite and special projects of them all. Though retired now, he made a trip to Beth Israel and examined his work of art. He determined that it could be fixed and that he would come out of retirement to do it. Like any fine artist, the Holy Ark was a part of him. Touching it again and restoring it to wholeness would be a privilege. On June 12th, the artist will take the Holy Ark (without the Torahs) back to his studio in Houston, to make repairs and refinish the piece. The project restoration will take two months and extensive handiwork. While the Holy Ark is gone, we will replace it with the Holy Ark we use at alternative services. It will sit on a draped table and hold one Torah scroll. It will look small in its place where a large and beautiful Holy Ark usually stands; but, we’ll be patient while repairs are made and summer services get underway. In August, when the Holy Ark is restored to its sacred space in the Gordon Chapel, we’ll rededicate it for its consecrated purpose and restore the Torah scrolls to their proper place. The artist will be paid for his craftsmanship and skill to make whole again what he lovingly created so many years ago. I am so pleased that we’re able to give him the pleasure of restoring his work, and that we can look forward to welcoming back a familiar part of our worship space with such anticipation and gratitude. Donations for the restoration project are welcome and may be sent to Congregation Beth Israel at 5600 N. Braeswood Blvd., Houston, TX, 77096, attn. : Michael Jenkins. Torah teaches, “Make Me a sanctuary that I, God, may dwell among them.” It doesn’t add that when it needs repair that we must do it, but it’s implied in what we also learn, “Adonai Yimloch L’olam Va’ed,” Adonai will rule for ever and ever.